Reflected and diffuse radiation on the reverse side of solar modules can increase the power output of solar modules without major efficiency improvements. Historically, bifacial (BF) solar cells were targeted at building integrated PV applications or in areas where much of the available solar energy is diffuse sunlight which has bounced off the ground and surrounding objects, i.e. extreme latitudes and snow‑prone regions. However, the combination of plateauing peak efficiencies from standard screen-printed solar cells and significant reductions in the cost of solar glass in recent years making the use of dual glass (DG) encapsulation viable has pushed bifacial solar modules back into the spotlight . Direct radiation from the sun. Indirect diffuse radiation caused by air particles, clouds and others. Reflected radiation from surfaces close to the solar module. Reflected radiation is generally not taken into account in solar energy calculations. Diffuse radiation measurements refer to radiation sources above the horizontal plane. The usual method of measuring solar radiation uses a pyranometer which is mounted horizontally and only measures radiation above the horizontal plane. Even in a tilted configuration the pyranometer will not measure radiation below the plane of measurement (see Fig. 1). Fig. 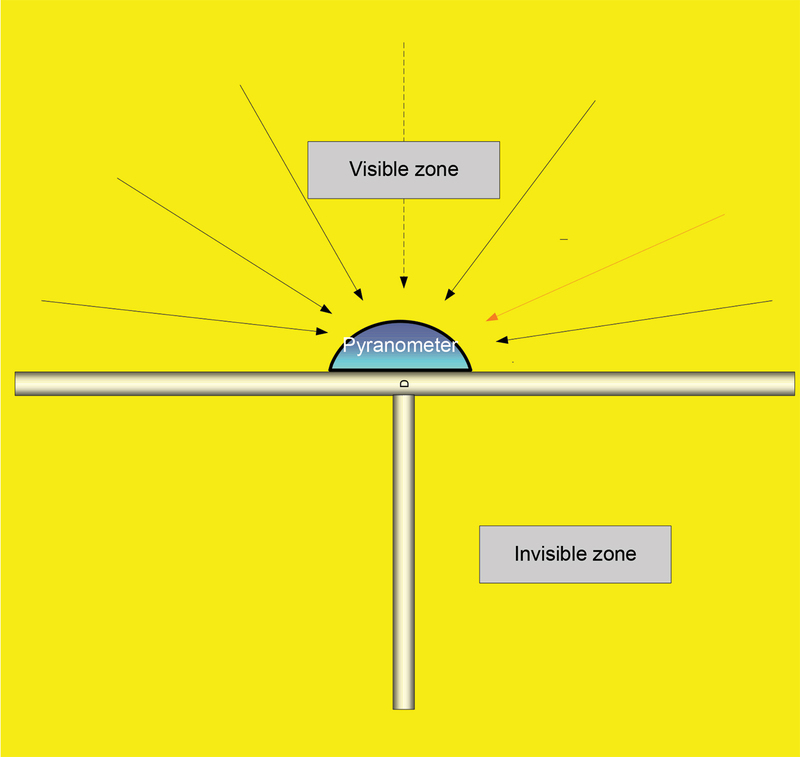 1: Measurement of solar radiation with a pyranometer. Diffuse radiation can contribute a substantial amount of the total radiation but much of this will not be captured in a tilted or horizontally mounted module. Tilting the module increases the intensity of the direct radiation but blocks off a large portion of the indirect radiation. Diffuse radiation is isoptropic in nature, i.e. it has the same value irrespective of the source whereas reflected radiation will depend on the nature of the surface surrounding the solar array, the angle of the array and other factors. The front panel will receive both direct and diffuse radiation, the ratio depending on the tilt angle of the panel. Near field scatter: reflected direct and diffuse radiation. Diffuse radiation: non-reflected radiation directly from diffuse sources. Table 1: Albedo values for various surfaces . The ratio of diffuse light to direct light will vary with conditions. Under low radiance due to cloud the percentage of diffuse light will be higher than under sunny conditions and the gain compared to monofacial PV can therefore be higher than under sunny conditions . Monofacial PV cells are usually constructed with a reflective layer on the rear face of the cell to allow better absorption of light falling on the front surface. Photons which do not get absorbed in the front layer can be absorbed on the return trip, so increasing the efficiency of the cell. This means that photons travelling in the opposite direction to normal can generate electricity and if photons falling on the back face can be allowed to enter the cell, they can be used effectively to generate electricity. This is achieved by partially removing the reflective layer, which also acts as a conductor (see Fig. 2). Fig. 2: Reflected light on the rear of the panel . Reduction of the conductive layer at the rear of the cell increases the resistance and more conductors are required at the rear of the cell than at the front to compensate for this. This reduces the area of the rear of the cell available to radiation. The construction of the different types of PV cell is are more complex than that shown and the conversion is not quite as simple. There are other steps required to make a BF cell which works efficiently. 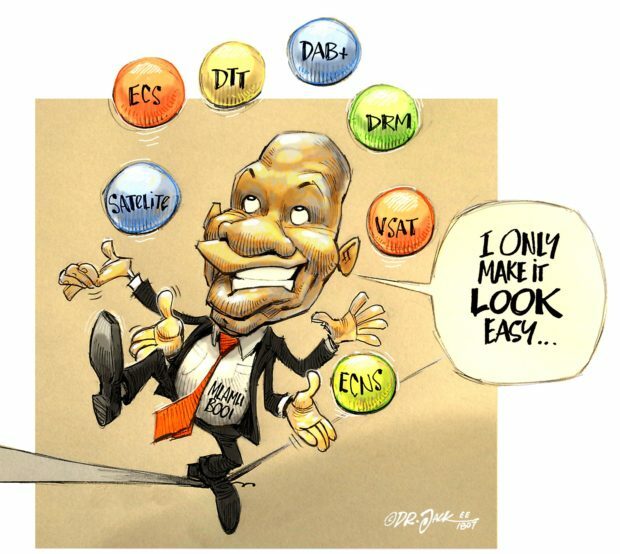 Several designs have emerged which use the BF principle. Most involve modification of existing cells, but there are several which have been designed specifically as BF cells. Two types of bifacial cell construction are in common use in the market: the heterojunction and the passivated emitter rear cell (PERC). Heterojunction cells use monocrystalline silicon while the PERC cell is available in both mono and polycrystalline silicon versions. 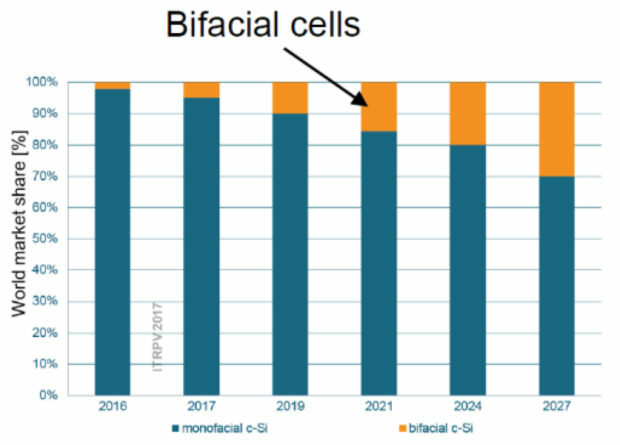 Bifacial cells are more complex to manufacture and this adds to the cost of the module. The efficiency of the rear illumination is lower than the front illumination, as shown in Table 2. This is largely due to the increased area occupied by conductors on the rear of the cell compared to the front. several BF solar modules . Monofacial (MF) crystalline silicon panels are usually encased in opaque encapsulant at the rear but this method cannot be used with BF systems. The module must have transparent back and front surfaces that provide mechanical strength. In addition, the cells must be enclosed in a layer of protective material. 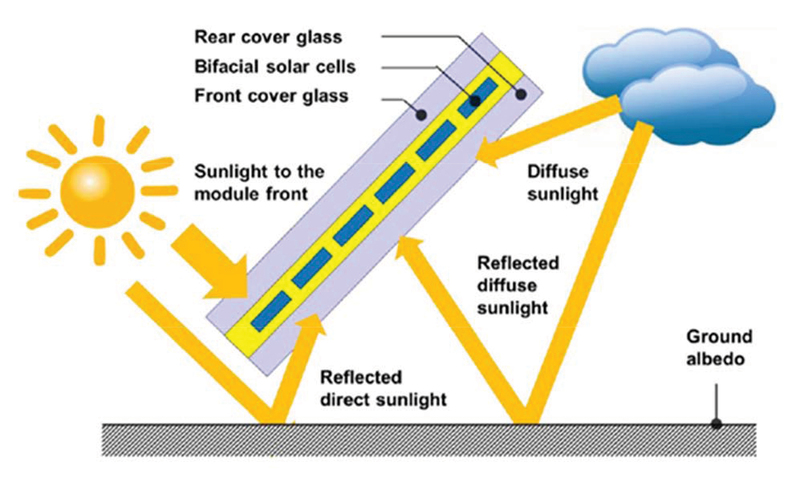 The most common configuration adopted is a double layer of photovoltaic glass enclosing the cells which are encapsulated in a protective polymer material. Either a UV-resistant transparent backsheet material or an additional layer of solar glass is required to allow light to shine on the rear of a bifacial cell. In most cases, as shown in Fig. 4, manufacturers opt for a glass-on-glass package that generally improves field durability as compared to glass-on-film options. The glass-on-glass package is more rigid, which reduces mechanical stress on cells during transportation, handling and installation, as well as stress due to environmental conditions such as wind or snow. The configuration is also less permeable to water, which may reduce annual degradation rates. Bifacial modules are frameless. 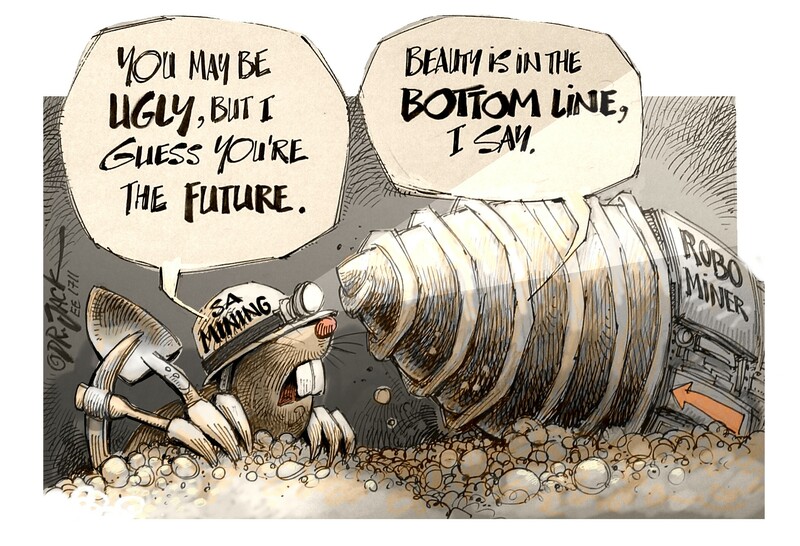 Eliminating the aluminum frame effectively reduces opportunities for potential-induced degradation (PID) . Fig. 3: The difference between mono-facial and bi-facial PV cells. Reduction in microcracking, delamination and moisture corrosion. No potential-induced degradation as there is no metal frame requiring earthing. Higher mechanical strength and less flexing. Table 3 lists some of the BF systems available on the market at the moment, with their characteristics. Table 3: BF solar PV module characteristics. Several parameters are used in the industry to describe the characteristics of BF solar modules. This is the ratio between the rear side and front side efficiencies, or the ratio of the front to the rear power measured under standard test conditions. This is additional power gained from the back of the module compared to the power from the front of the module at standard test conditions. The bifacial gain depends on the mounting (structure, height, tilt angle and others) and the albedo of the ground surface. Fig. 4: Construction of a dual glass BF module. YBi = The power from the BF module. YMo = The power from an MF module under the same conditions. This is the ratio of light reflected from a surface to the incident light and varies with different surface types. Fig. 5: Effect of height on BF gain. Albedo 80%, row pitch 2,5 m .
This is the ratio of the ground area covered by the PV modules to the total ground area occupied by the installation. 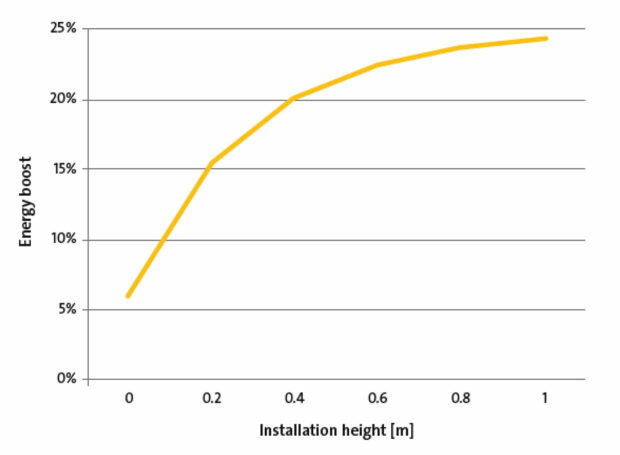 This ratio has an effect on the reflected light and can influence the performance of the BF panel. Since bifacial modules absorb solar radiation from both sides, they allow a variety of tilt and installation options and are ideal for elevated ground, rooftop, desert and snowy area installations or on-water applications. Mounting systems designed to optimise the backscatter and reflection from roofs and ground-mount installations raise the structure above the ground or roof to capture more scattered or reflected light. Raising the structure above the ground increases the amount of radiation reaching the back of the panel and so improves the performance and bifacial gain. Increasing the spacing between rows also improves the bifacial gain (see Fig. 6). Fig. 6: Radiation on vertically mounted BF panel (Sanyo). The gain increase seems to flatten out at a height of about 1 m. Increasing the height of the structure has a very pronounced effect on roof mount arrays, especially where flat roofs are involved. 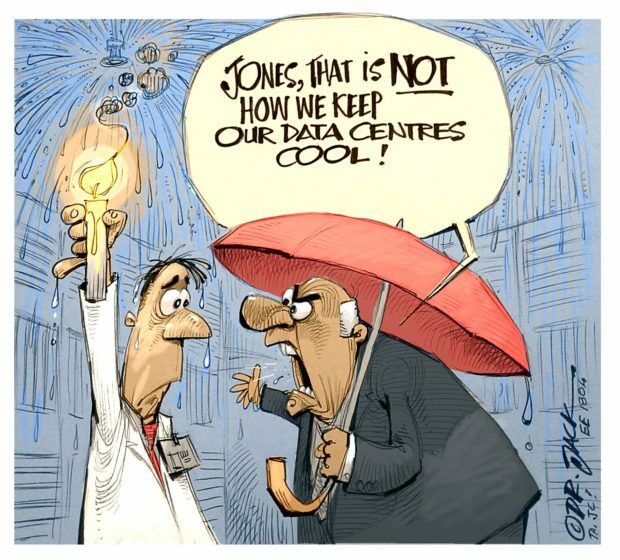 The danger of increased wind loading can be a problem. Several mounting structure manufacturers have produced elevated structures for both ground and roof installations. The gains obtained with increased height can be put to good use in open shed-type structures such as parking lots and open air storage bays, as well as entertainment and hospitality areas. The transparent encapsulant allows some light to filter through the module. One of the most interesting applications to emerge from the BF array is the possibility of a vertical mounted array. Vertically mounted BF panels have been used effectively in the past as sound and light barriers on highways. A vertically mounted panel occupies much less space than a horizontal or tilted panel. Two options exist, classic north-south orientation and alternative east-west facing. 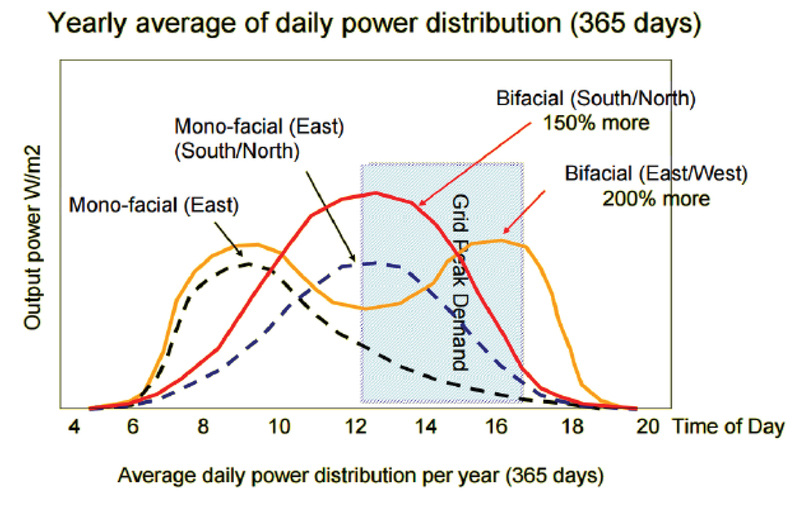 To better match onsite demand with PV generation profiles throughout the day, there is a trend to use an east-west panel orientation, where half of the panels are tilted eastwards to create a generation peak in the morning and the remaining half is tilted westwards to allow for another generation peak in the afternoon (see Fig. 7). This double-peak profile can better match onsite electricity use, especially for residential and commercial installations. Fig. 7: Daily radiation pattern on east-west BF modules . 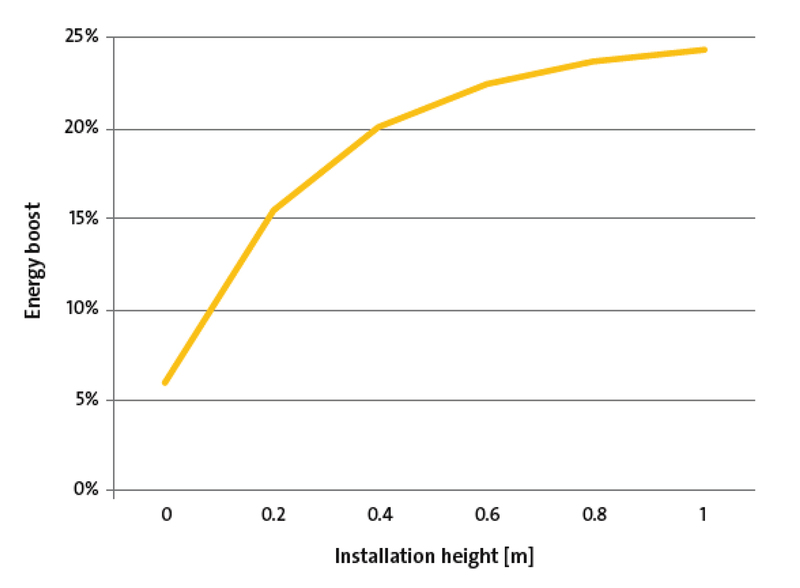 This unconventional approach can go one step further if vertically mounted east-west facing bifacial modules are used, which would more than halve the number of modules needed for an equivalent installation. This configuration would again produce two generation peaks but would also benefit from the additional diffuse light entering the module. BF panels allows a vertical mounted east-west orientation with potential to provide higher energy production than monofacial panels. In the north-south orientation, the front panel receives direct and diffuse radiation and the rear of the panel receives diffuse radiation. In the east-west orientation with opposite sides facing east and west, both sides receive direct and reflected radiation at different times of the day (see Fig. 7). 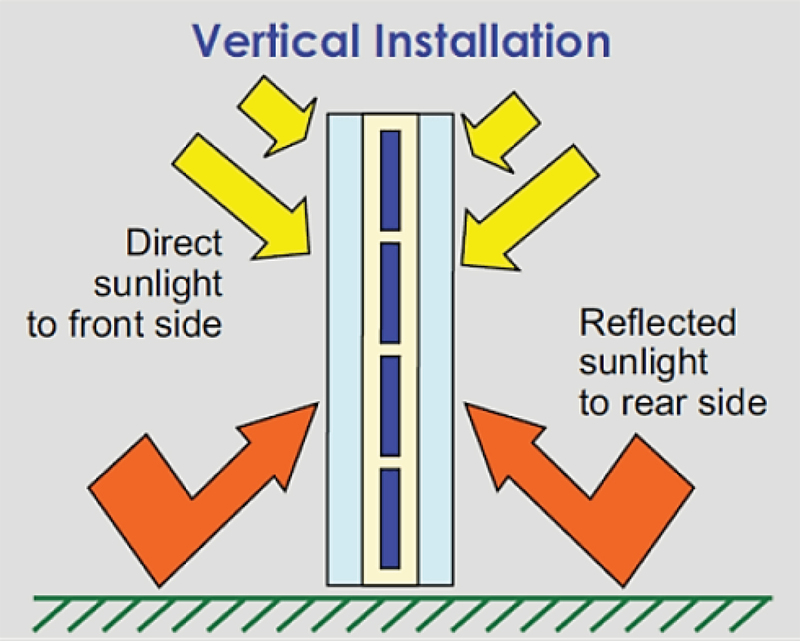 At first site, the mounting method seems to be inefficient, as at midday, the sun is at right angles to the panels and there should be no output. Significant output is due to the fact that both front and rear surfaces are receiving the maximum amount of diffuse and reflected radiation. The radiation received by a module will depend to a large extent upon the reflectivity (albedo) of nearby objects and the ground. This is particularly important for vertical modules around noon in summer, when direct beam sunshine is most intense but when the angle of the sun means that the direct beam sunshine received by the modules is relatively small. 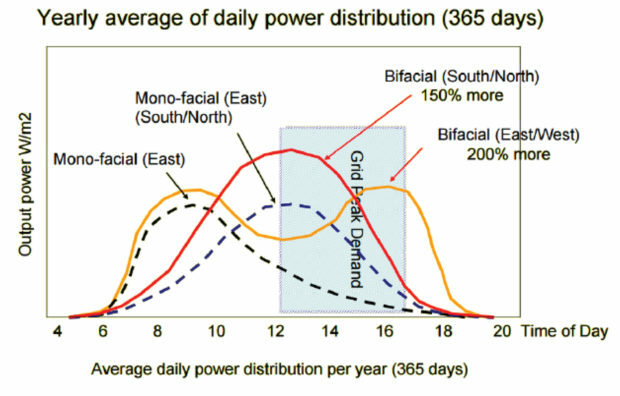 A vertical bifacial panel reduces dust and snow accumulation and provides two output peaks during the day, with the second peak aligned to the peak electricity demand (see Fig. 8). Fig. 8: Comparison between mounting options . One of the reasons for greater energy production is that the temperature of the east-west module is lower during the time of maximum irradiance, compared to the south oriented module. Many networks with high penetrations of solar have surplus of energy during the midday peak production times and a shortage during the off-peak period. Shifting the peaks by using vertical mount east-west orientation for new PV gives a more even energy production curve (see Fig. 9). Although there are several projects using BF modules, the percentage of BF modules in the market is very small at the moment but is expected to increase significantly in future as more products come to market and more installations are done. 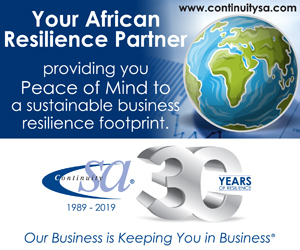 The possible improvement of up to 30% in output is expected to be far more attractive than the few percentage points increase in efficiency that might be achieved with technology development. Fig. 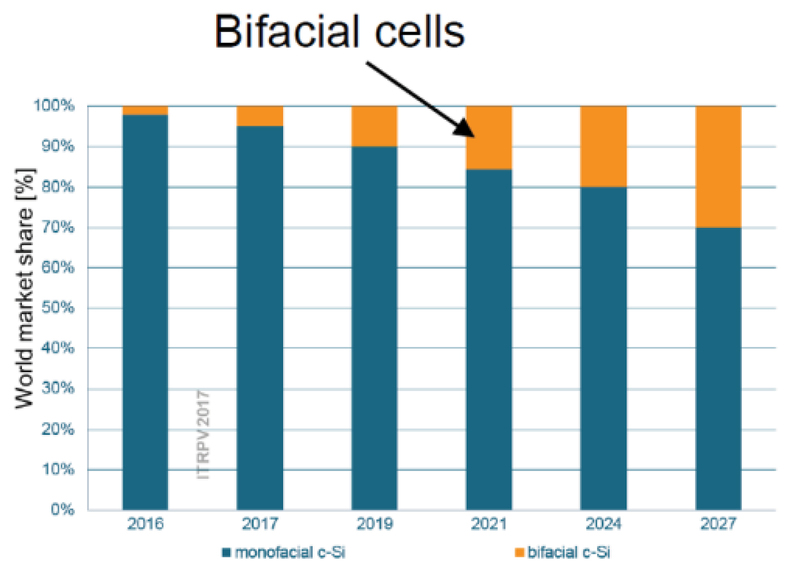 9: Expected growth in BF cell usage . T Dullweber, et al: “Bifacial PERC+ solar cells: status of industrial implementation and future perspectives”, bifiPV2017 workshop, Konstanz, October 2017. W Herman: “Performance characteristics of bifacial PV modules and power labelling”, bifiPV2017 workshop, Konstanz, October 2017.